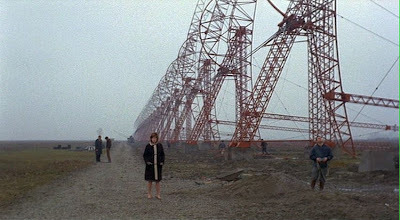 The scene in Red Desert [1, 2] in which Corrado and Giuliana visit the radio telescope installation is an excellent example of the unique manner in whi ch Michelangelo Antonioni laid out the geography in this film. 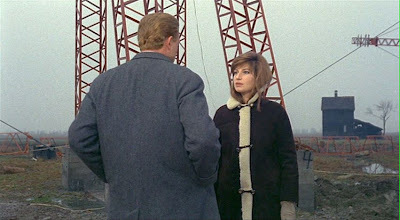 By the use of oblique camera angles and elliptical action, Antonioni achieves a disorienting effect that causes the viewer to struggle constantly with the reality presented. 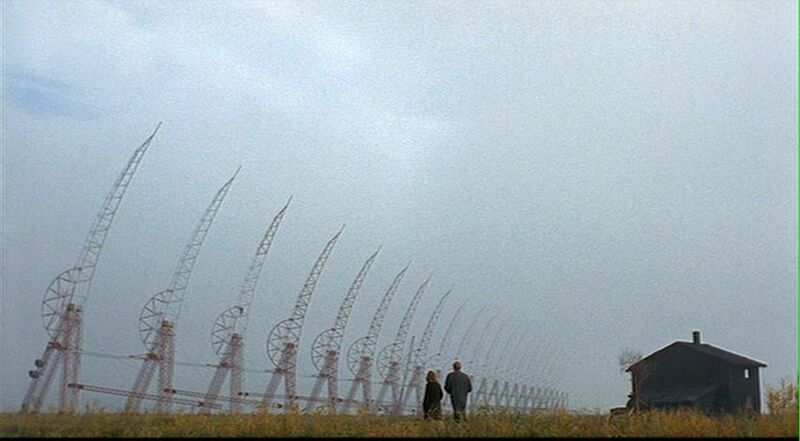 In this way the radar structures become determining factors throughout the scene, since the viewer must constantly orient himself with respect to them. As the scene progresses, these structures, along with a striking black house in the background, take on the character of active participants. 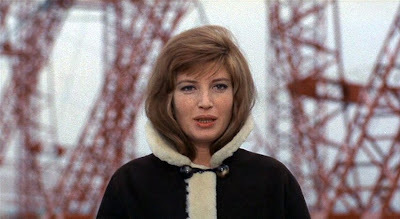 The overall effect of the kinetics is thus to establish viewer empathy towards Giuliana’s psychological dislocation. Just prior to this scene, Corrado and Giuliana have visited the apartment of a man that Corrado is interested in interviewing as a possible employee. 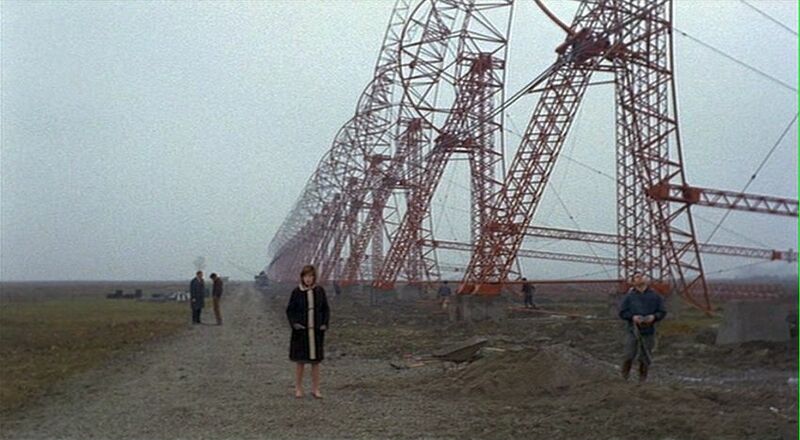 They go on in the present scene to seek him out at his place of work – the radar installation. Corrado and Giuliana enter the frame from the right in extreme long shot. A sign post about human height occupies a balanced position on the left side of the screen. The camera pans to the left so that the sign and the two characters remain in balance as they walk towards the center of the frame. Before the characters pass the sign, a man appears from the left of the frame and walks to the right, having just passed in front of a black house in the distance. The camera accelerates its panning rate at this point to reestablish a balanced frame. The sign post is now in the middle of the frame, with Corrado and Giuliana still on the right and the house along with the man who has come to greet them on the left. With the house balancing the composition on the left, the camera ends its pan as the couple reach the sign and stop. The man walking from the left finally reaches the two characters, where they apparently converse. Giuliana then walks to the left of the screen, away from the two men talking, until she passes in front of the black house in the distance. 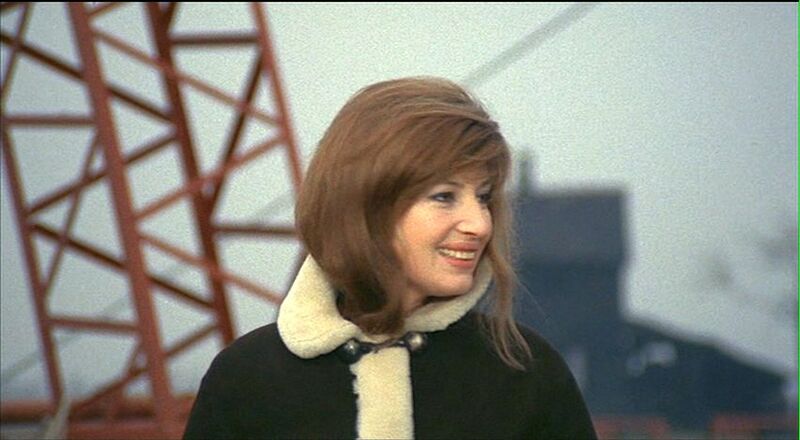 Cut to a closer shot of Giuliana (in long shot now) in front of the black house, which now dominates the background. As she begins to pass the house, moving screen left, Corrado enters from the right of the frame. They both continue their movement to the left, until first Giuliana walks out of frame, and then Corrado. The house remains alone for several seconds. see stretches far into the distance. Corrado and Giuliana continue their movem ent to the left and toward the row of towers. Cut to a low-angle shot of the upper part of one of the radar towers. 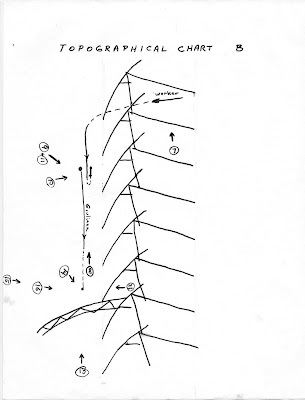 Because of its curvature to the left of the screen, it indicates that the camera position is now on the other side of the radar installation from that of Shot 3 (refer to Topographical Chart A -- see the end of this article for an overview of the topographical charts). The camera then tilts downward to show the black house seen before in the distance on the left side of the frame. Giuliana enters the frame on the right in medium shot in front of the tower. 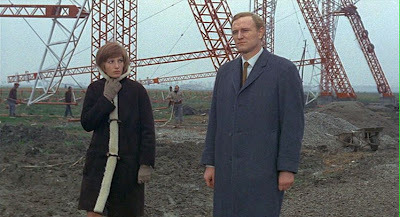 Once again the frame is in perfect balance: the base of the structure is in center midground, Giuliana is in the right foreground, and the house is at frame left in the background. Cut to Giuliana seen from a new angle (see Topographical Chart A) though she is still on the extreme right side of the frame. This is a high-angle shot with most of the frame occupied by the lattice-like structure of the tower support, which is in the foreground and in blurred focus. The angle of view plus the visual clash between the red tower structure and the green grass behind it make Giuliana look small and insignificant. 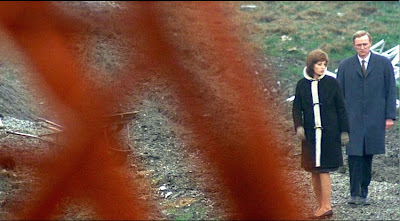 On the extreme right of the frame, Corrado is partially visible (and it is possible that he may have been entirely visible in the original 35 mm print version). A man is seen walking from right to left in medium long shot, the camera panning with his movement. 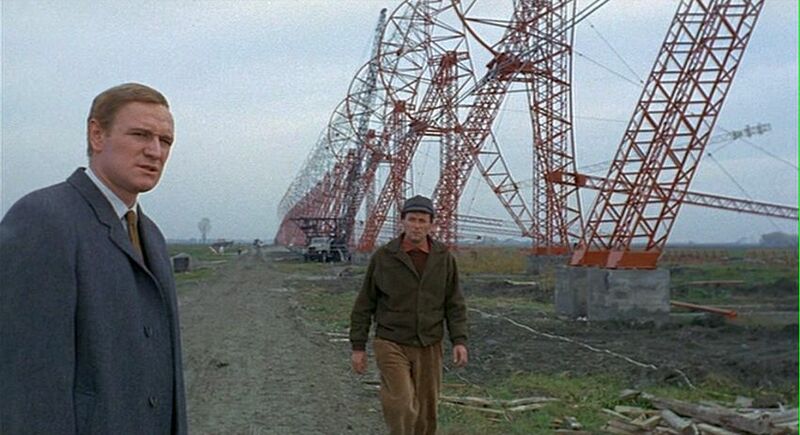 The radar towers in the background serve as the only reference in which to locate this man. In other words, by using our knowledge of where Corrado and Giuliana are and the direction in which Corrado is looking in combination with our knowledge of the structure of the individual radar towers seen in previous shots, plus our assumption that they are all identical, we are intuitively able to figure out where this man is located. Thus, like Shot 4, the choice of camera angle forces the viewer to relate to the radar tower structures and causes the tower structures to be almost active participants in the scene. It is to be inferred that the man seen in this shot is the man whose house Giuliana and Corrado had visited in the scene immediately preceding the present one and that he is the one in whom Corrado is interested as a possible employee. The final composition of this shot has Corrado in the left background, Giuliana at midground center- right, and the worker on the right foreground. Giuliana has been turned in this shot to enable the camera to include the radar tower structures in the background. 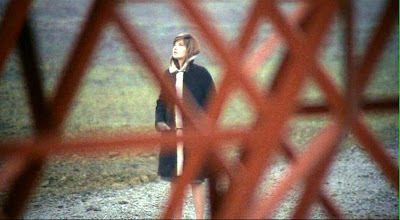 Had she not been moved, the background would have been the same as in Shot 8 – looking down the pathway that runs parallel to the radar towers. Cut back to the same view as Shot 9. Giuliana moves to the right, down the pathway, and the worker comes forward towards Corrado. Giuliana is now walking in the opposite direction along the path from that which she and Corrado had taken in Shot 6. 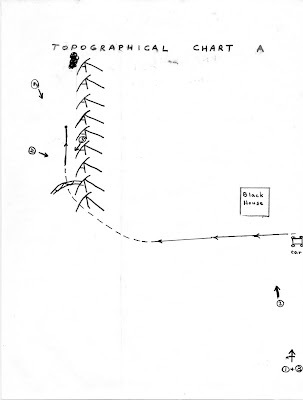 The worker’s movement restores the straight line formation that had existed in Shot 9, running from Corrado to the black house. The worker turns his head backward, looking in Giuliana’s direction (Giuliana is still in the frame before the cut to Shot 12). Cut to a low-angle shot of a radar structure not hitherto seen. 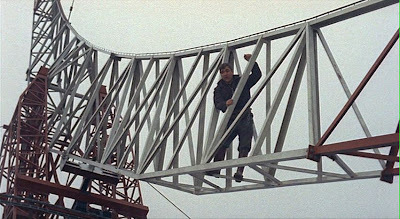 A man working on the structure and somewhat encaged in its girders is seen moving slightly to the left, and the camera pans to the left following the architecture of the structure. Then the camera tilts downward to reveal Giuliana in extreme long shot looking up at the man. In the background Corrado and other worker are seen conversing. The initial view and the subsequent pan are a slow disclosure and the viewer might well struggle to determine where he is in reference to the main characters before Giuliana comes into view. In particular, Giuliana’s question and glance upward in Shot 12 might possibly pre pare the viewer for a low-angle shot of what she is looking at from roughly her position for Shot 13. The initial low-angle view of Shot 13 partially fulfils this expectation, but the curvature of the radar towers indicates that the camera is on the opposite side from Giuliana of the structure first seen in this shot and that the camera is in fact in the position indicated on the Topographical Chart B. Thus the viewer again orients himself with respect to the asymmetrical geometry of the radar antennae. Giuliana: “He was a neighbor. Did he accept?" Corrado then walks rightward in front of Giuliana. He passes out of the frame on the right, leaving Giuliana smiling after him in the center. The black house is behind her on the right, and some radar metalwork is visible on the left behind her. She turns around, waves to the man she had been talking to, and departs screen right. This is a telephoto shot, and it causes the black house to loom massively in the background, having an effect not unlike that of the ocean-going ships seen at other times in the film. After Giuliana departs the frame on the right, the camera lingers on the black house for a moment. 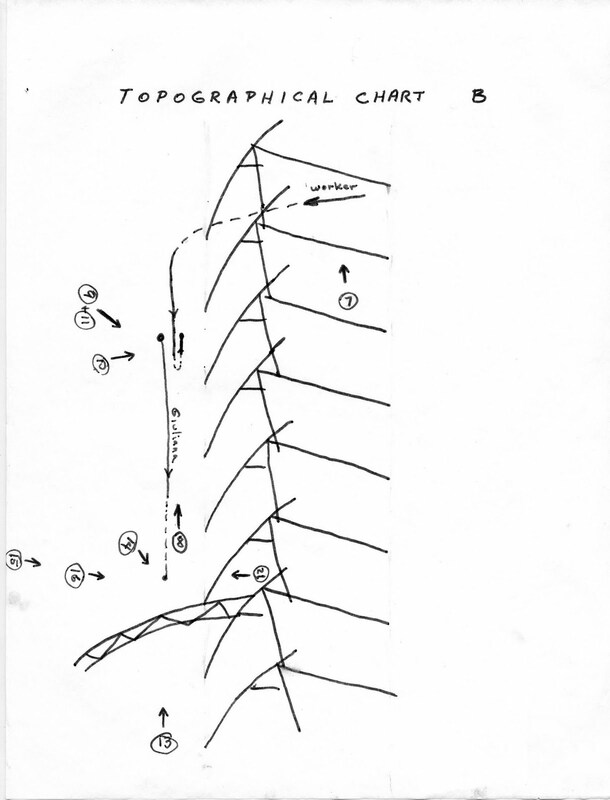 The Topographical charts presented here are a schematic representation of all the camera positions for this scene. Chart A depicts the positions for the first six shots, and Chart B for the subsequent ten shots. We have attempted here not to produce a scale drawing, but merely to construct the geometry of the entire scene and locate the relative positions of the camera with respect to the basic elements within that geometry. The camera position for each shot is depicted by an encircled number, and the arrows indicate in what direction the camera was pointed. For simplicity of presentation, we have given the positions as if a single focal-length lens was used for the scene, which was not the case. Thus Shots 2 and 16 were almost certainly telephoto shots taken from the same positions as the respective preceding shots, but the camera position has been advanced forward on the chart to indicate that the image w as enlarged. The movement of Giuliana, Corrado, and the interviewed worker is depicted by the lines with arrows in the charts – the dashed line portions of which represent movement that is not presented in the scene, but which must have taken place for purposes of continuity. It should be noted that the dashed line movement that Antonioni chose not to relate in this scene is precisely that which would enable the viewer, were that material present in the film, to simply locate all the action. Instead, the viewer must continually reorient himself with respect to the geometry of the radar towers and the black house. Thus the continuity of physical existence is broken down and fragmented here in much the same way as that which presumably exists in Giuliana’s mind. 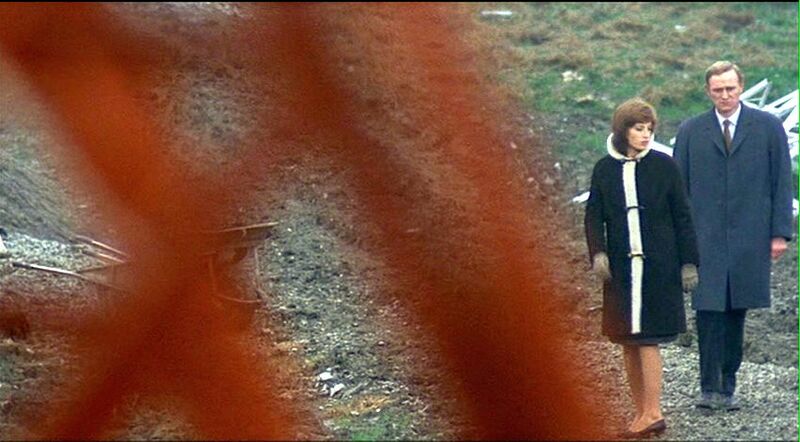 Phenomenology and Red Desert, http://www.filmsufi.com/2010/09/phenomenology-and-red-desert.html. Mike Ceraso contributed to this article.